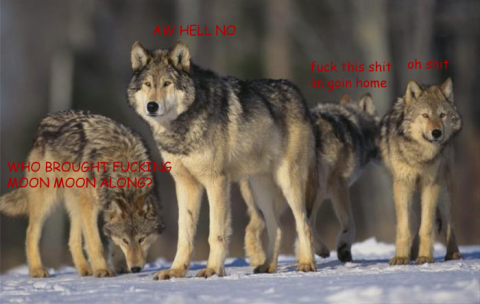 When Doge isn’t enough, there’s always Moon Moon, the intellectually stunted wolf. It’s been nearly three years since Moon Moon bound onto our screens and stumbled awkwardly into our hearts, banging his head on the way. The post immediately went viral—though Kitchiki wisely updated the post to remove an offensive term—accumulating over 158,000 notes in the first two weeks. Today it has over 800,000. Moon Moon’s exposure rapidly expanded from that initial Tumblr post, finding popularity on photo-sharing sites like Tickled and Imgur. 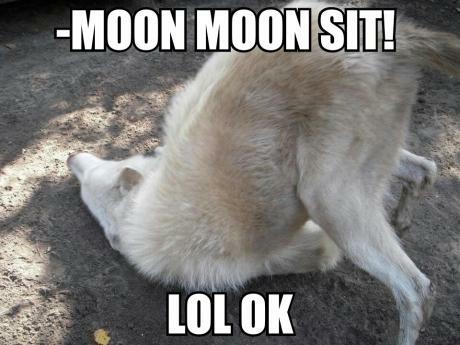 Moon Moon certainly shares a few similarities with Doge, its more popular dumb-dog counterpart. Although Doge was created in 2010, it wasn’t until 2013 that that meme began to really pick up steam on Tumblr and Imgur. Whereas Doge jokes are in a more clipped two-word rhythm, always beginning with one of a handful of regular modifiers (“so,” “such,” “many,” “much,” and “very”), Moon Moon comics are more narrative and character-driven, almost like a one-panel comic strip. The meme is still going strong. Interest in it has stayed pretty constant, according to Google Trends. That’s thanks in part to a dedicated Moon Moon subreddit, which adds new videos and GIFs to the Moon Moon legend every day.